CPS Camp No. 21, Cascade Locks Oregon. 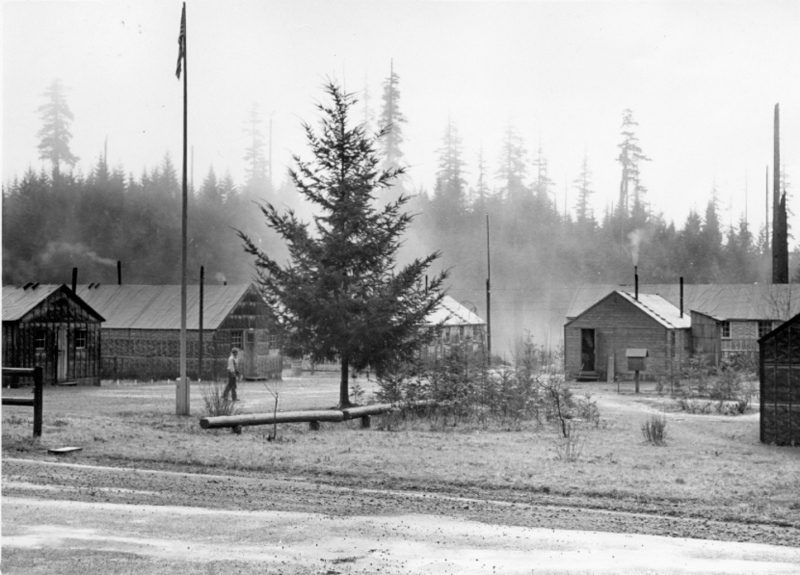 Camp - as seen from N. corner of office building; James Washburn, Marion Ross and Frank Neufeld; dorm 4 and kitchen shown in background. CPS Camp No. 21, Cascade Locks Oregon. 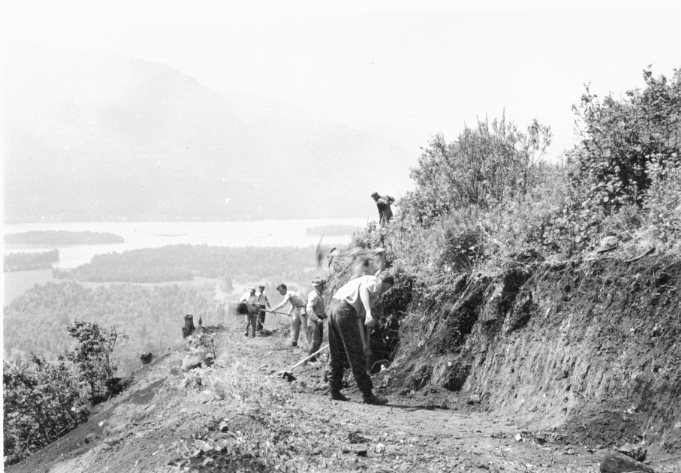 Pick and shovel work on Aldrich Butte road; Columbia River in background. CPS Camp No. 21, Cascade Locks Oregon. Group photo. CPS Camp No. 21, Cascade Locks Oregon. Larch Mtn. Camp - as seen from road in front of camp looking toward flag pole and shrubs as center. CPS Camp No. 21, Cascade Locks Oregon. 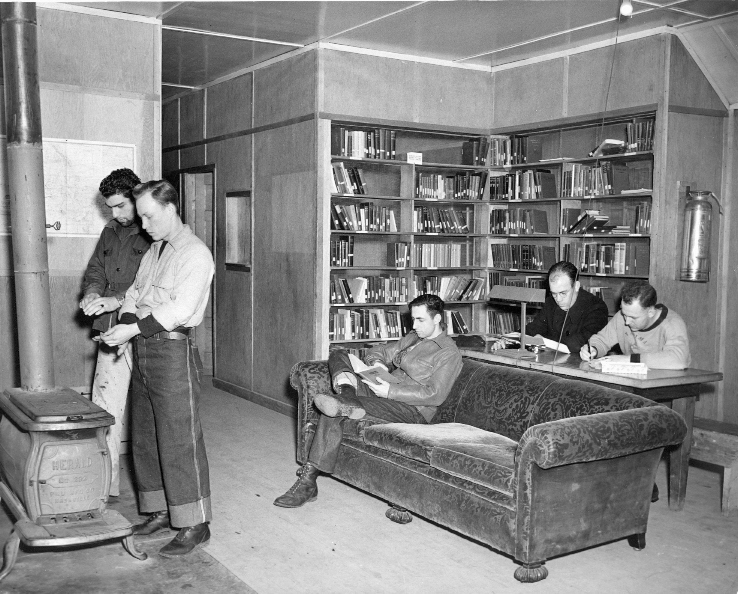 Interior of the original "Mark Schrock Library" - later destroyed by fire. CPS Camp No. 21, Cascade Locks Oregon. Library fire - showing roof well-burned, and fire in main portion of building, looking into building from SE end with music room & Columbian office in front-shot taken from between Infirmary and Chapel; January 26, 1943. David R. Vice and Philip Marzolf at Camp 21. 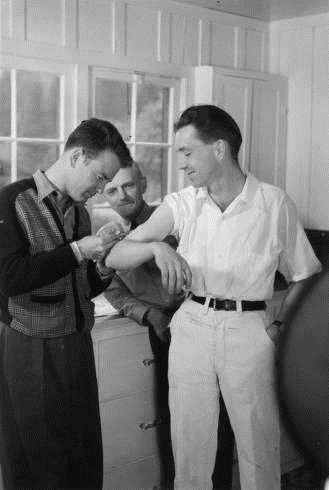 Left to right: Lew Ayres, Dr. Stone, William McReynolds in the infirmary. Splitting wood for the roof of one of the buildings at Camp 21. Hugh Merrick (later Brian Forsyth) is on far left and Henry Dasenbrock is second from left. Wayne Gregory working in the forest at Camp 21. Dorms at Camp 21. 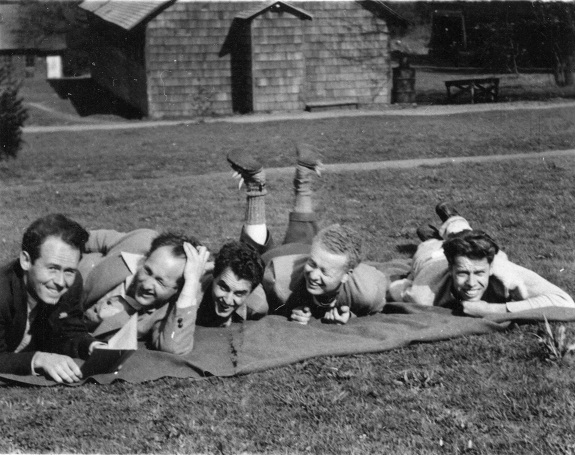 Left to right: Wilmer Carlsen, Ray Vanniman, Hugh Merrick (later Brian Forsyth) and Henry Dasenbrock. At Camp 21. Left to right: Don Baker, George Mauer, Alan B. McRae, Kemper Nomland, and unidentified person. 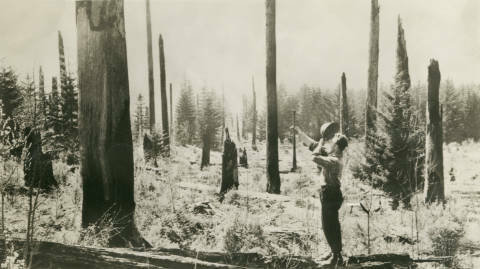 William F. Toothaker and unidentified CPS worker doing forestry work at Camp 21. 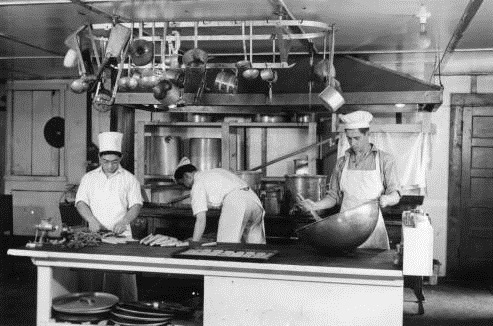 Kitchen crew at Camp 21. Left to right: George Yamada, unidentified, Alden C. Douglass. Mark and Mable Schrock with Albert Bohrer. Schrock and Bohrer were both directors of Camp 21. 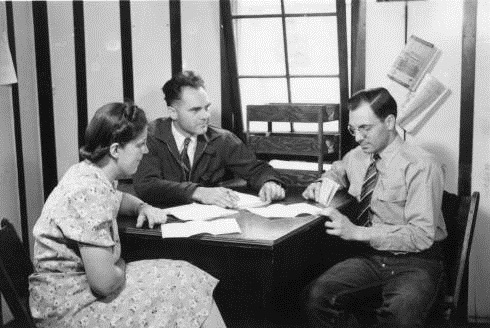 Left to right: Mabel Schrock, Mark Schrock, unidentified CPS worker, and Harry Prochaska at Camp 21. CPS Camp No. 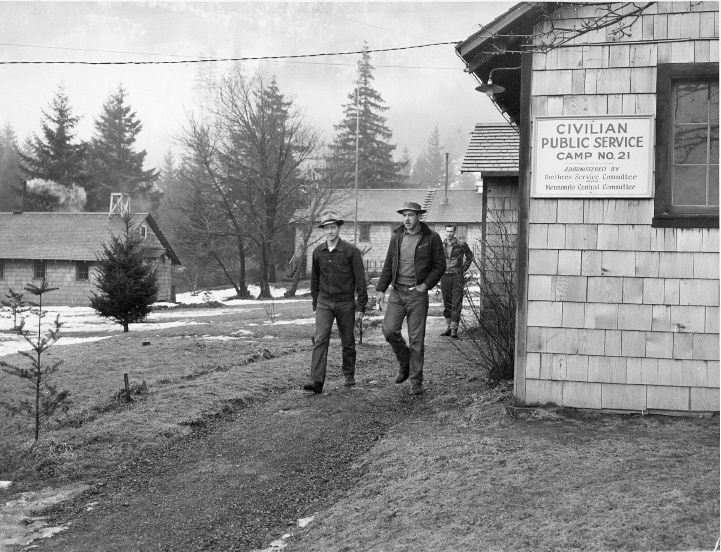 21, a Forest Service base camp located in Cascade Locks, Oregon operated by the Brethren Service Committee, opened in November 1941 and closed in July 1946. 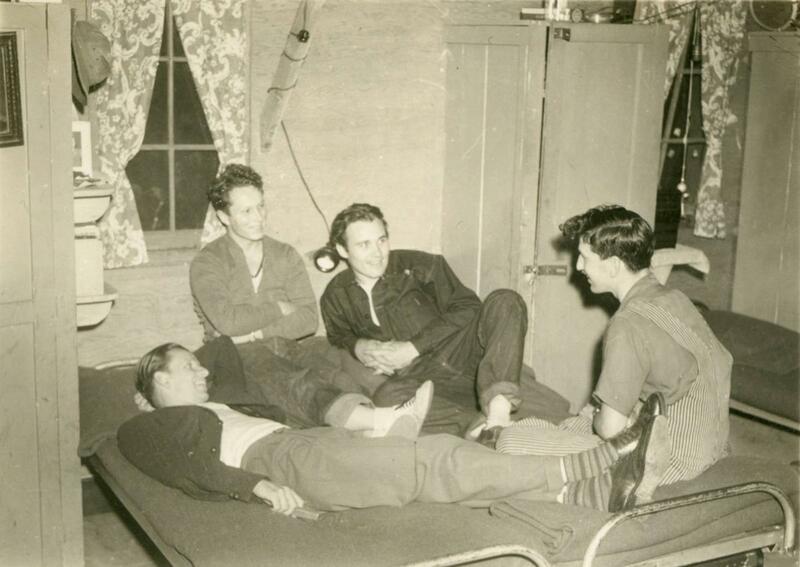 Men fought fires, conducted preventive and fire suppression work, and performed camp maintenance and construction. Cascade Locks was in service the longest of all the Brethren camps, one of two base camps in Oregon. 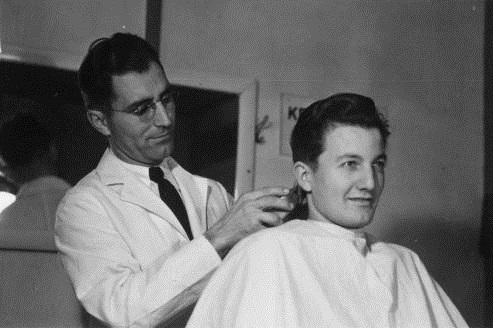 Located some forty miles east of Portland in the Columbia River Valley near Mount Hood, it was the largest CPS camp, staffed by five hundred-sixty draftees during its existence. Men in Brethren camps, when entering CPS reported a somewhat diverse list of denominational affiliations, with about half of the men reporting Brethren affiliation. The men performed physical labor demanded in forest service camps—fighting fires, preventive and preparatory measures, building roads and trails into the back country, felling dead trees, reforestation of burned out areas, camp maintenance and construction. Under the leadership of a talented director, Rev. Mark Y. Schrock, the men at Cascade Locks developed a vibrant democratic community that nurtured the arts and education. Almost immediately, they instituted a camp government to oversee all the aspects of camp life. To provide the men with personal items such as toiletries, stationery and work gloves they established a cooperative store based on the Rochdale Principles. The cooperative store operated until the camp closed in 1946. They remodeled a camp building to serve as a library with a collection of 2000 books. The library was destroyed by fire in January 1943 and the entire collection lost. The men remodeled another building as a library and restocked it with a second collection of nearly 3000 volumes. They remodeled yet another camp building to serve as a chapel where regular non-denominational services were held. The chapel served as the site for several weddings over the years. 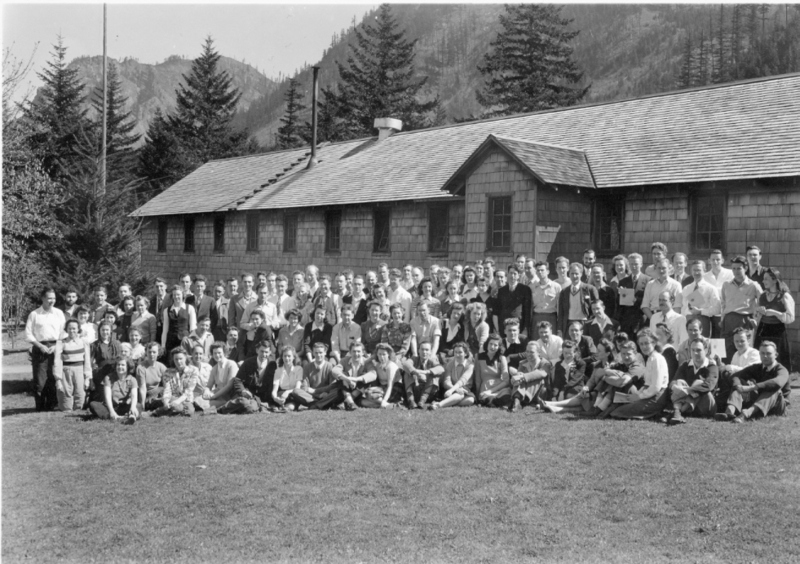 Cascade Locks became the most famous CPS camp in the country in March 1942 because of the arrival of the film actor, Lew Ayers, an event that received national publicity. During his two month stay at CPS Camp No. 21 Ayers worked in the infirmary and taught first aid. He neither asked for nor received special privileges. In April, he was reclassified 1-AO and joined the Army to become a medic and served with distinction In the Pacific theater. The director and men in the camp engaged in two major protests during 1942. The first was a protest of the order from Selective Service and the War Relocation Authority that a Japanese-American, George Kyoshi Yamada, be discharged from CPS so that he could be sent to a Japanese internment camp. Both Mark Schrock and the members of the camp wrote letters of protest and the men vowed to engage in non-violent direct action to stop any attempt to remove Yamada from the camp. Eventually, the War Relocation Authority relented and Yamada was allowed to transfer to an inland camp, CPS Camp No. 5 at Colorado Springs. 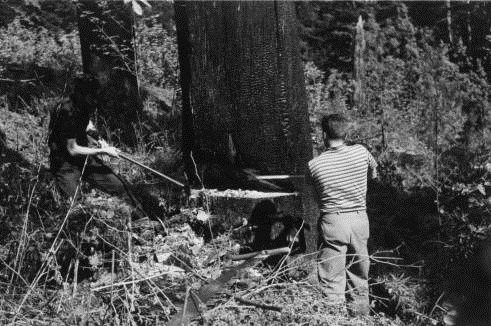 In the fall of 1942, the camp men protested an attempt by the Forest Service to have them build a road that would allow timber to be harvested for war-related purposes. The leadership of Brethren CPS supported the camp resulting in a change in Forest Service policy concerning work projects. All work projects in CPS camps had to be approved in Washington to ensure that they were not directly war-related. 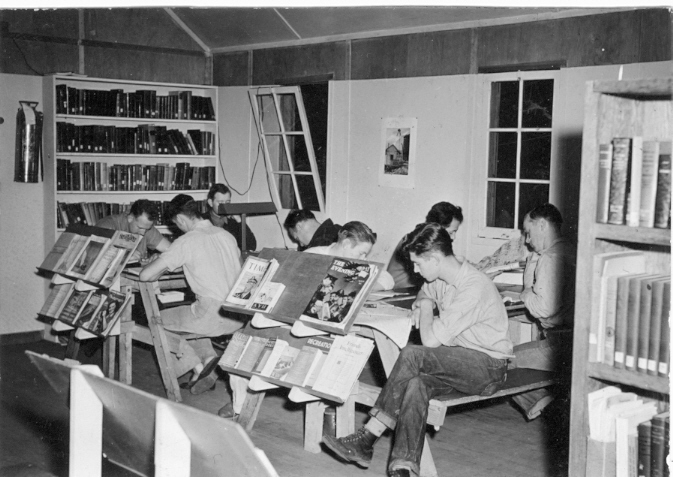 The camp published a newspaper, The Columbian, beginning in January 1942. The final issue appeared in February 1943, although more informal newsletters were published after that time. They also published a literary magazine, The Illiterati. Two issues were published at Cascade Locks, after which the publication moved to CPS Camp No. 56 at Waldport when the two principal figures, Kermit Sheets and Kemper Nomland, transferred there to participate in the School of Fine Arts. At least two original plays by Kermit Sheets were written and produced at Cascade Locks, The Stalingrad Stalemate and a Gilbert and Sullivan parody, The Mikado in CPS. CPS Camp No. 21 developed an active educational program including the School of Pacifist Living, an ambitious special study project directed by the Brethren educator Dan West. 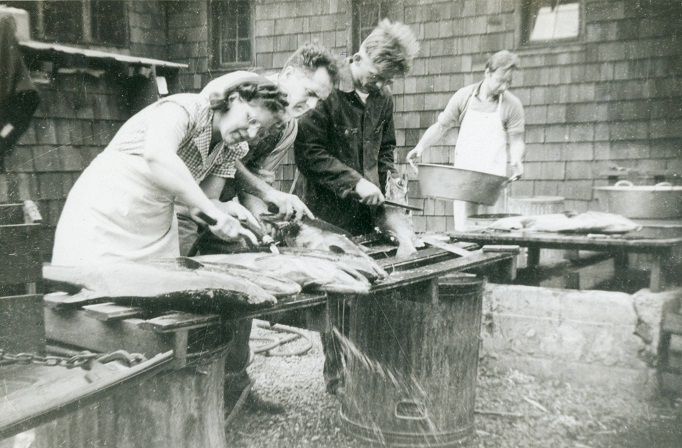 Near the end of the war, the men at Cascade Locks participated in war relief by sending food packages to Europe. 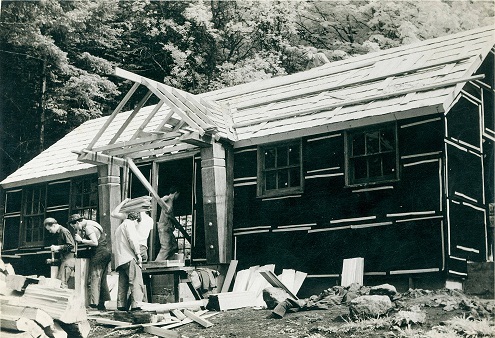 For more information on work in Brethren camps see Leslie Eisan, Pathways of Peace: A History of the Civilian Public Service Program Administered by the Brethren Service Committee. Elgin, IL: Brethren Publishing House, 1948. For stories from men who, as COs, walked to a different drummer during World War II, see Mary R. Hopkins, Editor, Men of Peace: World War II Conscientious Objectors. Caye Caulker, Belize: Producciones de le Hamaca, 2010, Charles F. Cooley, pp. 111-122; Douglas R. Johnson, 263-268. For more information about CPS No. 21 at Cascade Locks, see Jeffrey Kovac, Refusing War, Affirming Peace: A History of Civilian Public Service Camp #21 at Cascade Locks. Corvallis, OR: Oregon State University Press, 2009. See also: Charles Davis and Jeffrey Kovac, "Confrontation at the Locks: A Protest of Japanese Removal and Incarceration during World War II". Oregon Historical Quarterly Volume 107, Number 4 (Winter 2006), pp.486-509.